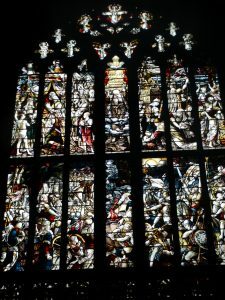 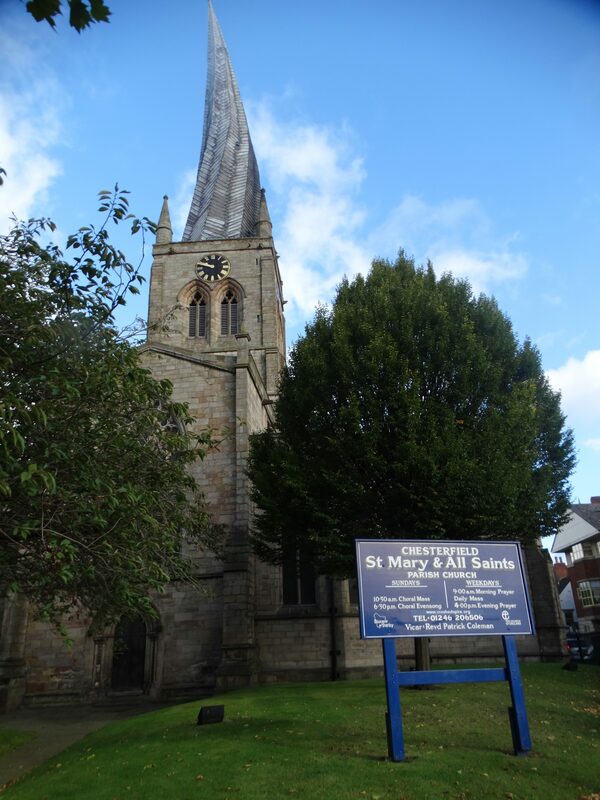 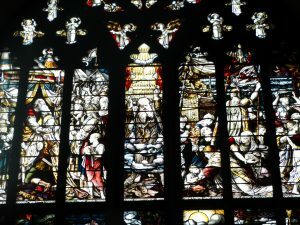 I am sure there are not many people who visit Holy Trinity Chesterfield before they visit the parish church – St Mary and All Saints. They are in the town centre, SK 385712 (although the OS does not have a symbol for twisted spire). 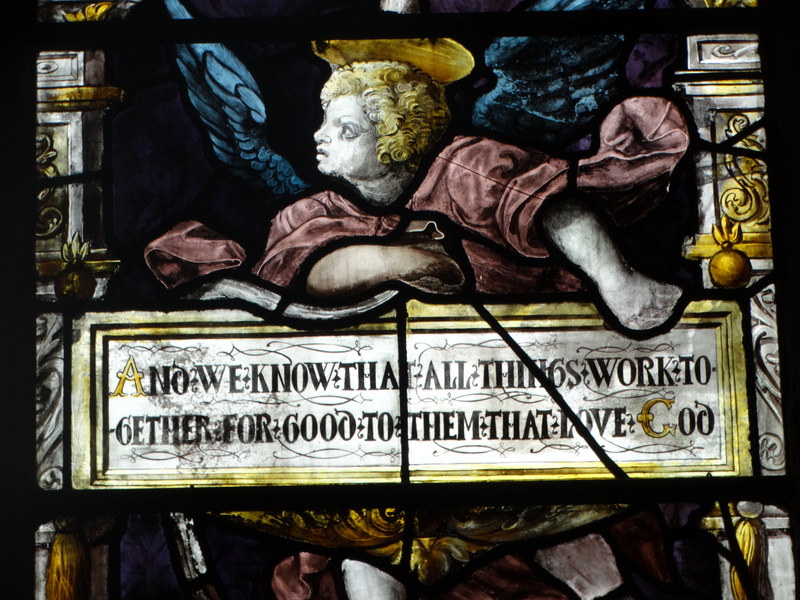 They have got the obvious web address – here. 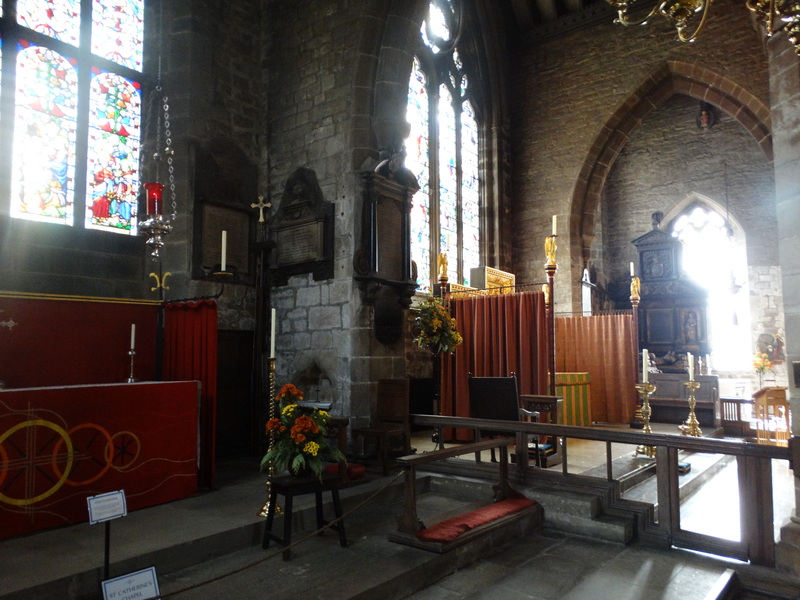 On Tuesday 3 October I had had a morning meeting – they have an excellent café and meeting rooms nearby – and then went and explored the church. 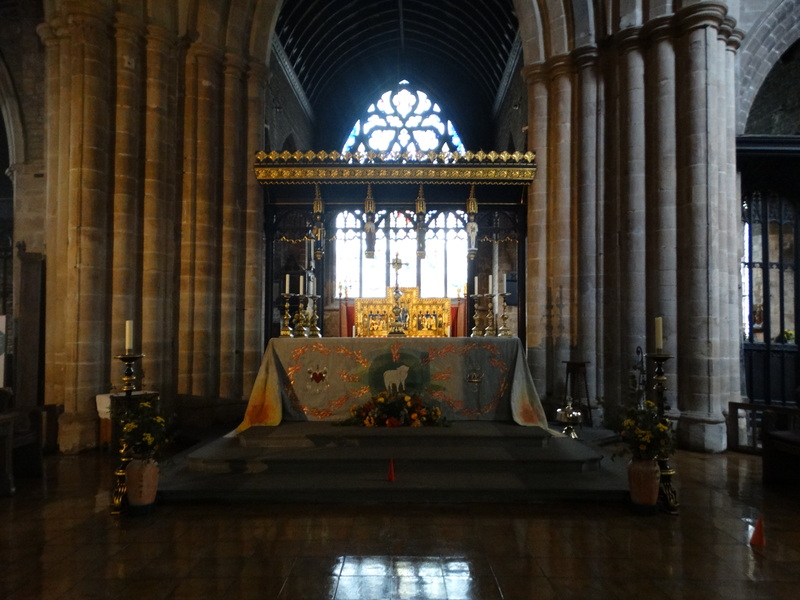 I wasn’t expecting a church geared to tourists, with staff and a lovely welcome. 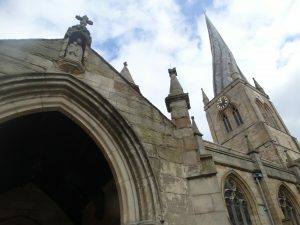 My fault for thinking that it is simply a church we see from the train and smile at its spire. 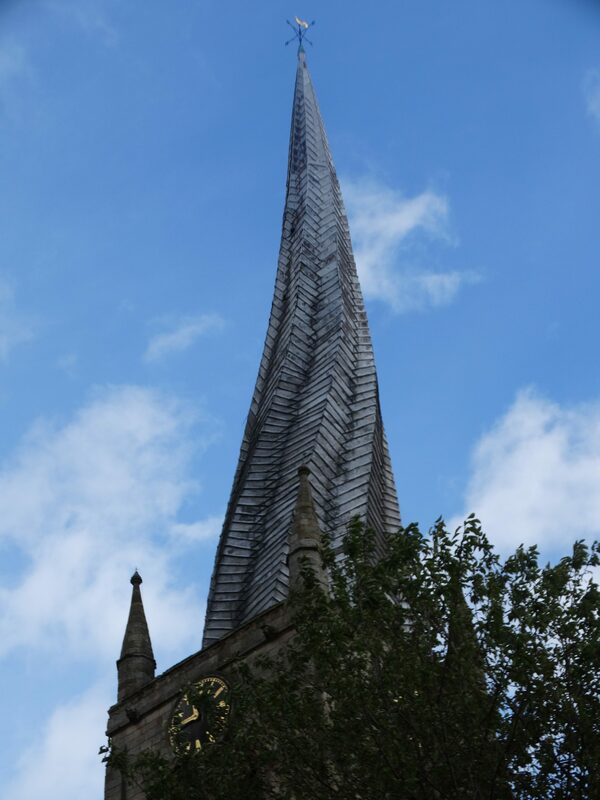 It is more than its spire! They do have tours up the spire – must go back and do that. 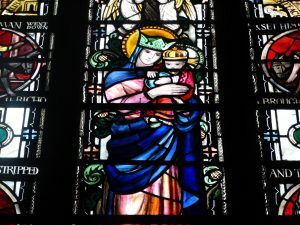 One of the displays in church tells the story that the spire was so surprised a Virgin was marrying in church that it turned and looked – the Children’s Guide says she was a beautiful bride! 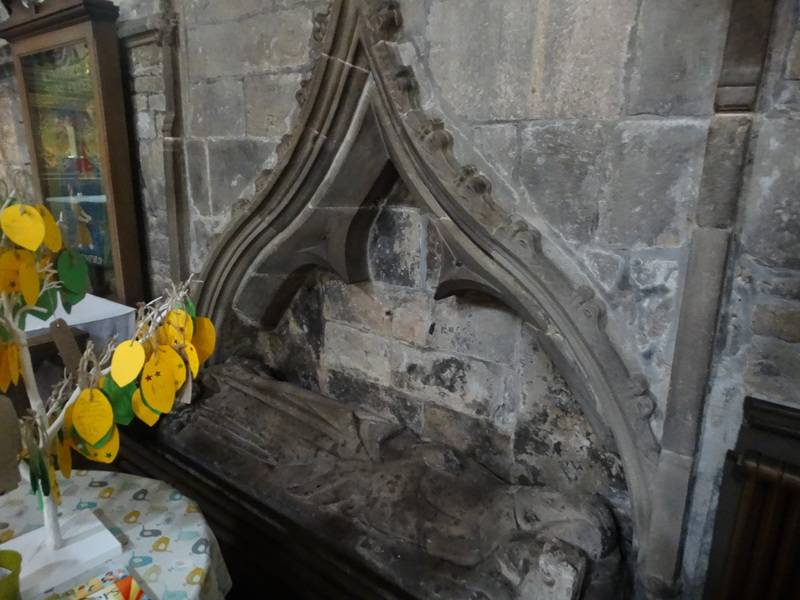 The first mention of a church here dates to a document of 1093, and the present building dates from the 1200s. 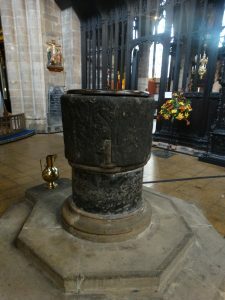 The spire was added at the end of the 1300s. 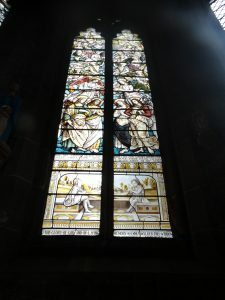 The West Front was rebuilt in 1509-49. 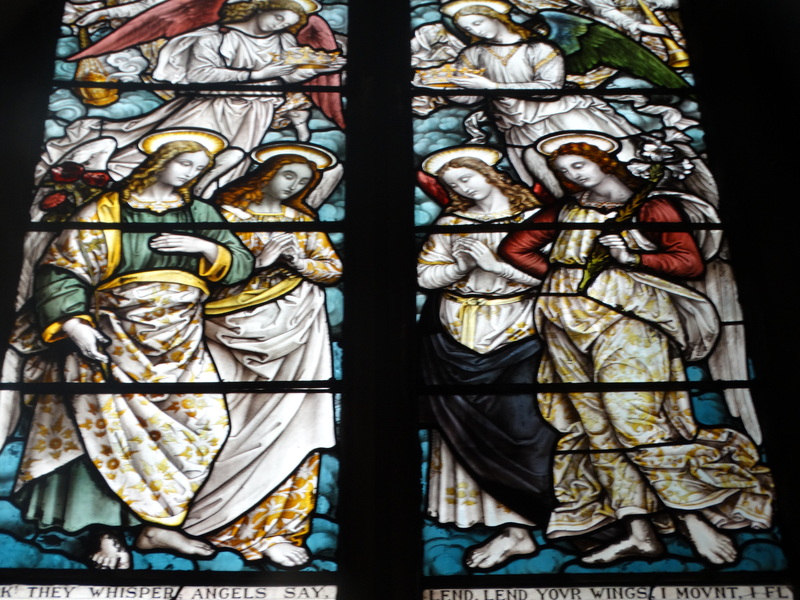 Much damage was done after the Reformation, and the church was restored in 1843 by George Gilbert Scott. 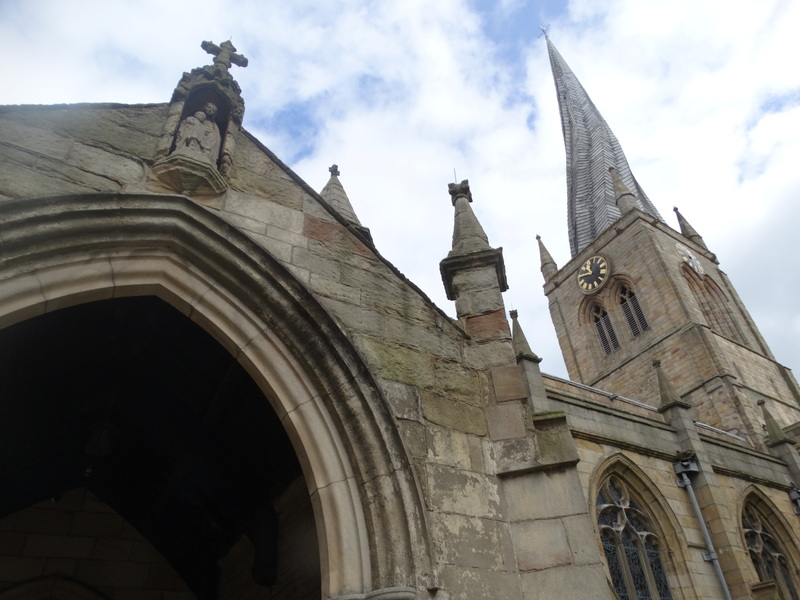 A fire in 1961 destroyed the North Transept, organ, and nearly reached the spire. You enter through a small shop at the west end, and enter the Nave. This is one of those churches where the determined blogger should go round with a notebook and work out what he has photoed. 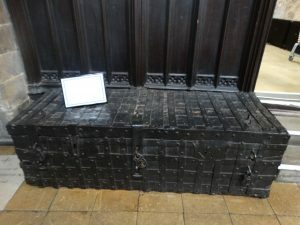 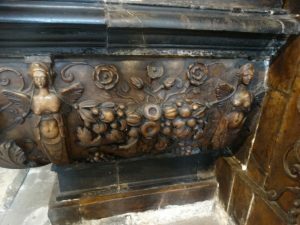 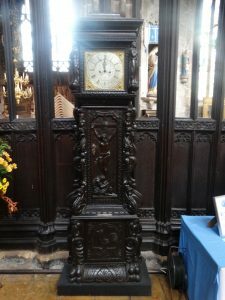 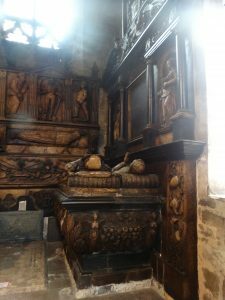 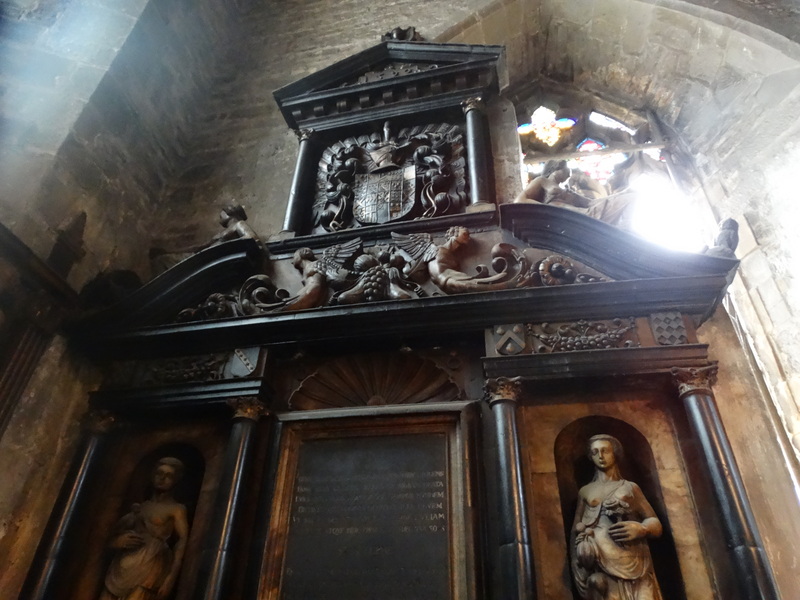 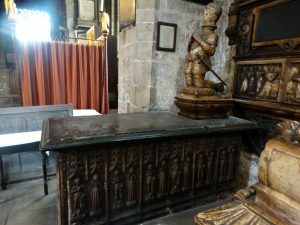 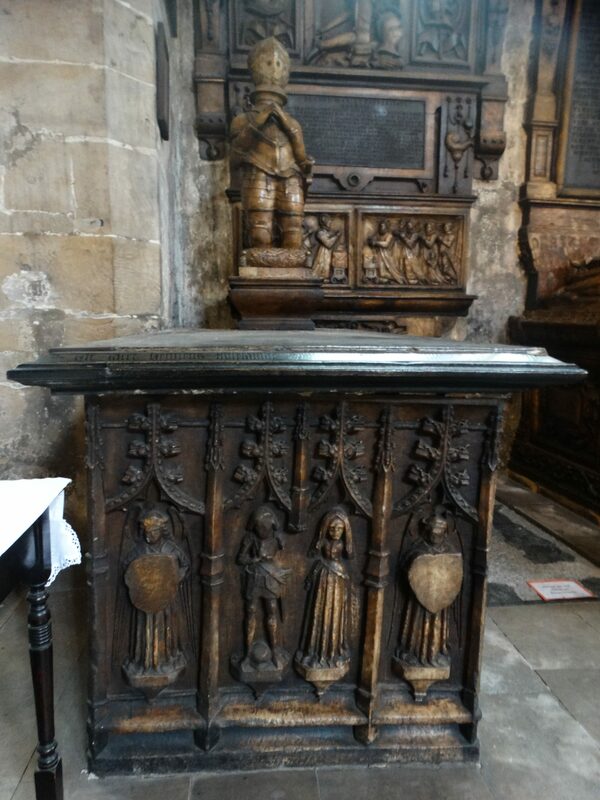 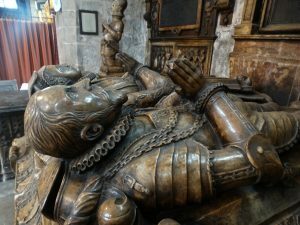 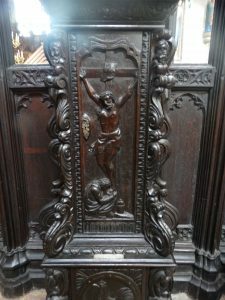 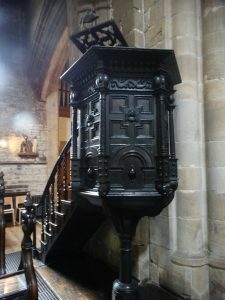 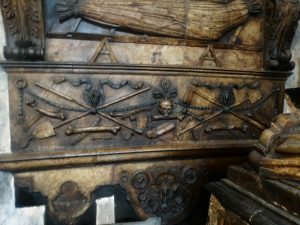 Or he just records that the pulpit is Jacobean, dating from about 1620 – it may have been made by the carvers of the Long Gallery at Haddon Hall. 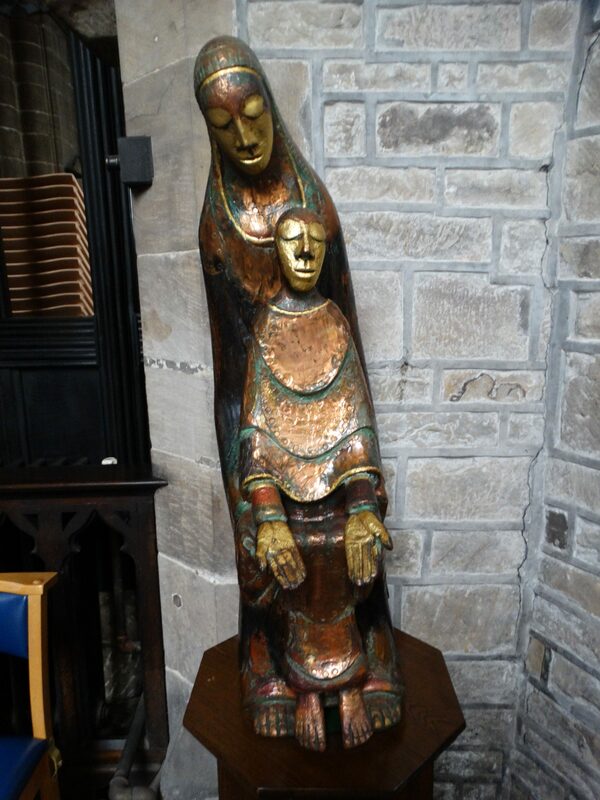 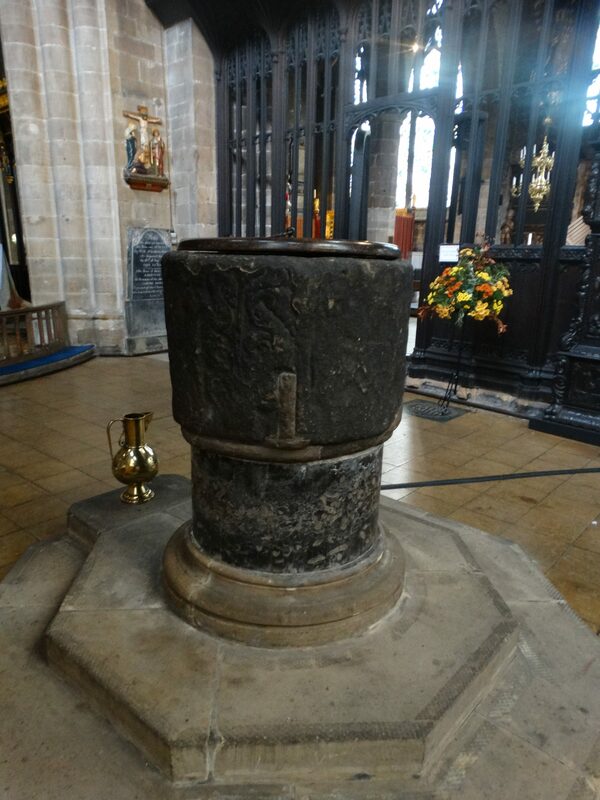 The font is Saxon, and the Madonna and Child by Peter Eugene Ball, a Millennium gift to the church. I think this is an early C14 effigy of a priest. 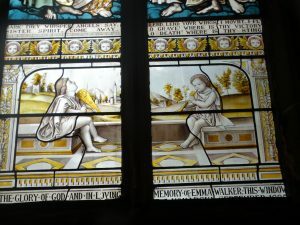 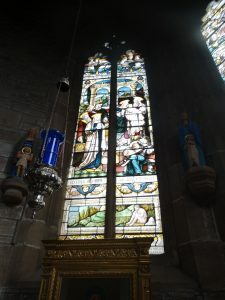 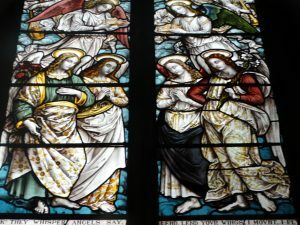 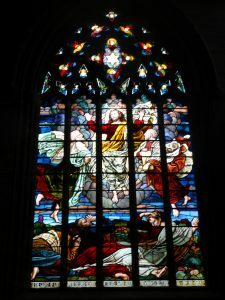 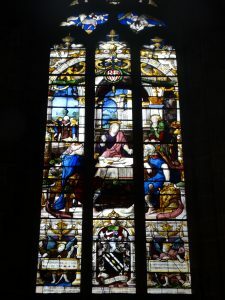 The West Window is by Hardman, and dates to 1890. 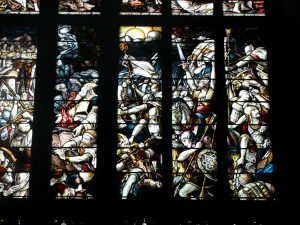 It shows scenes from the life of Joshua, in the Old Testament. 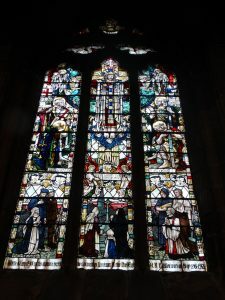 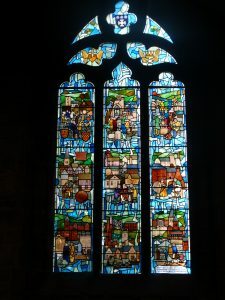 The Anniversary Window was given to the church by the people of Chesterfield in 1984 to celebrate the 750th anniversary of the church. It dates the history of the town from the C13 to the present day. 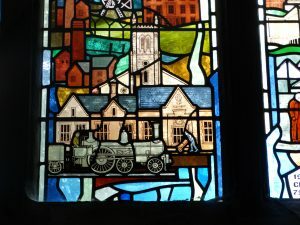 Here we have Clay Cross foundries and mines, the Midland station, Tapton House (home of George Stephenson), Holy Trinity church, and one of Stephenson’s locos. 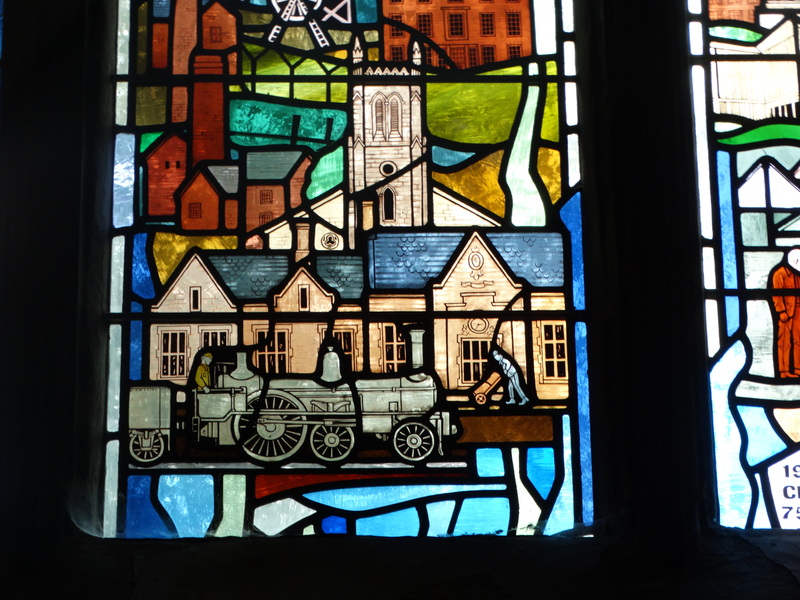 (Locomotives in windows also appear on this blog at Byrness and Cadeby). 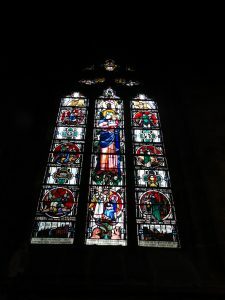 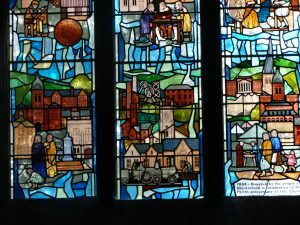 There is a display board about what you can see in the window, and a whole page in the guidebook – but neither tells you who designed and made the window! 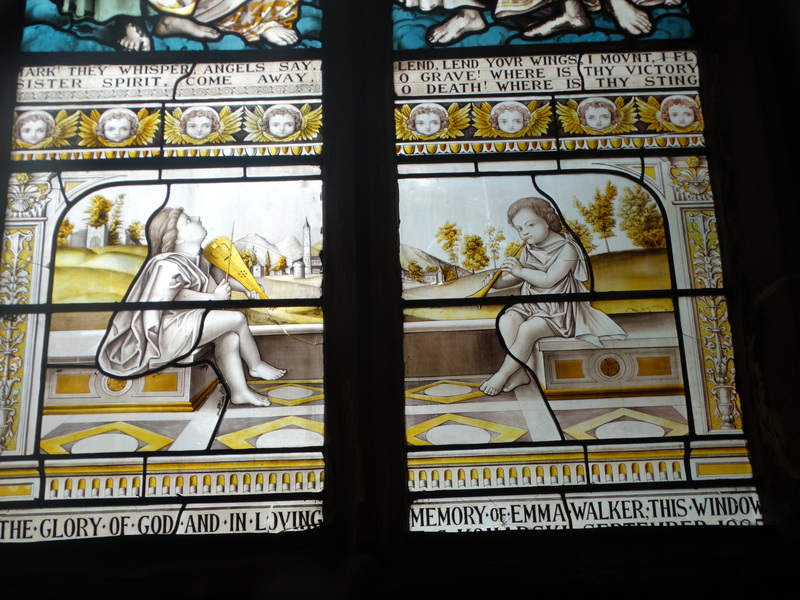 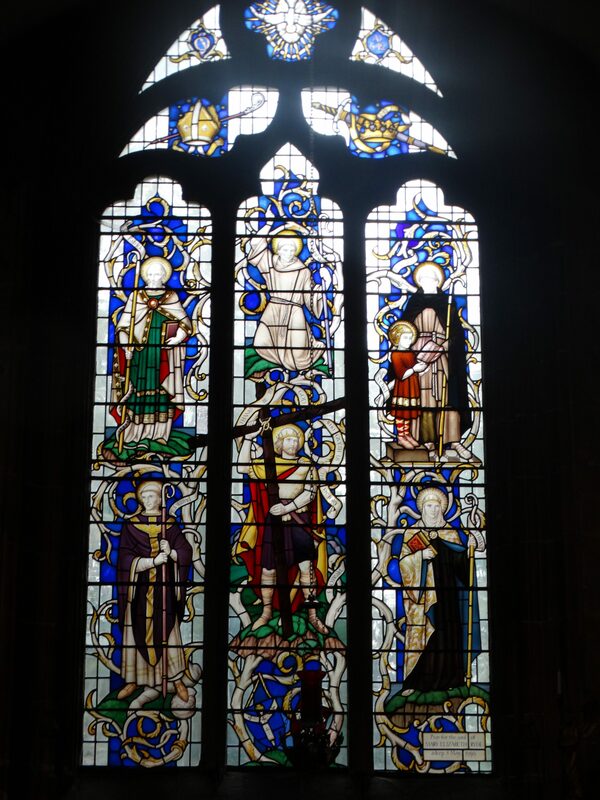 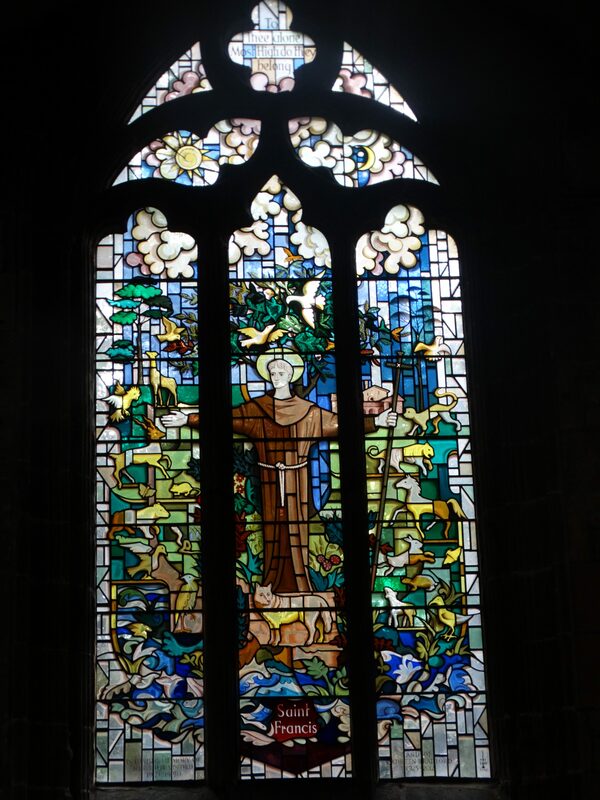 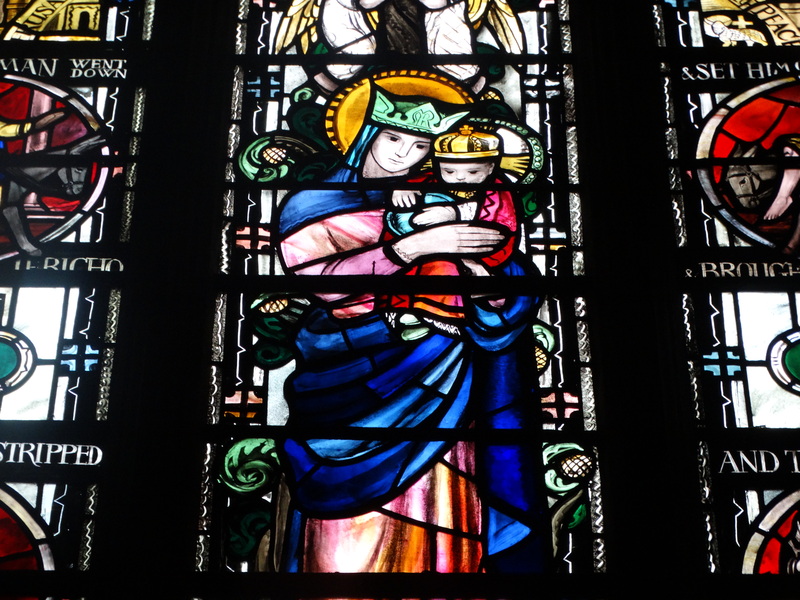 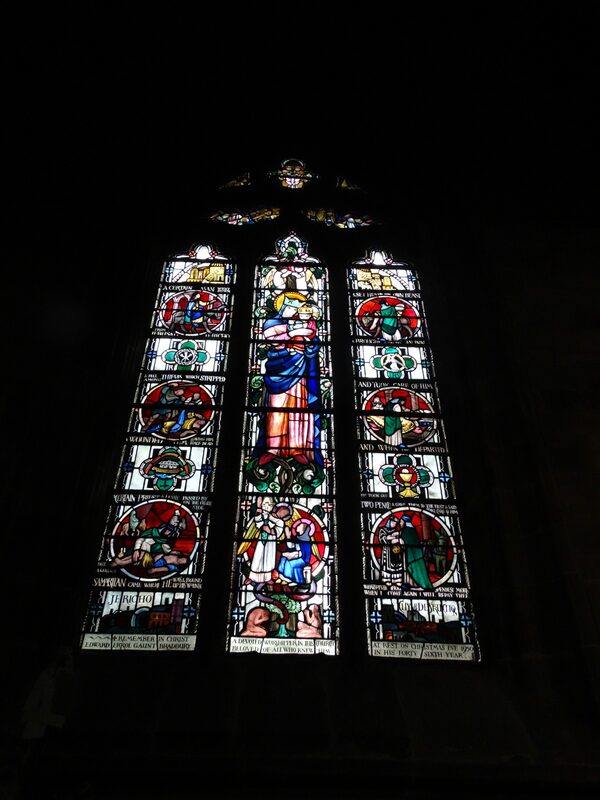 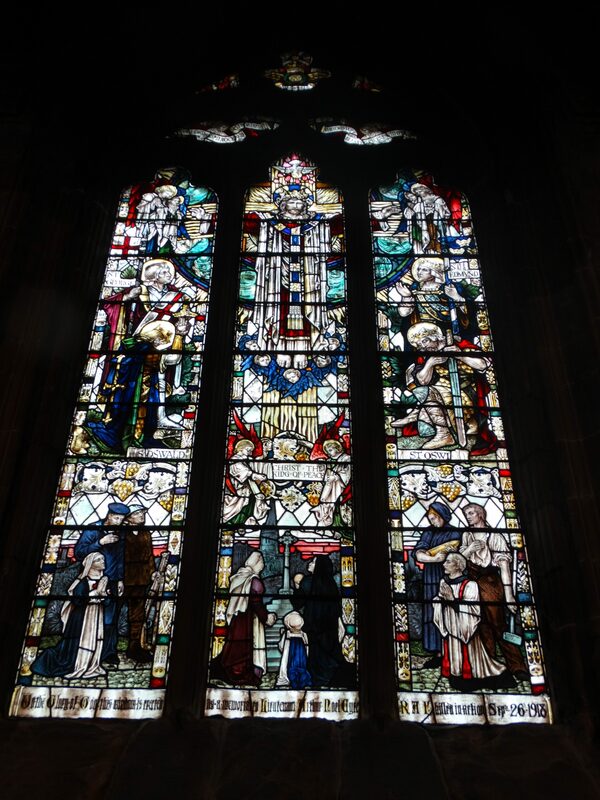 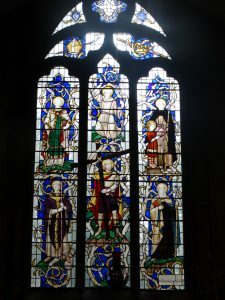 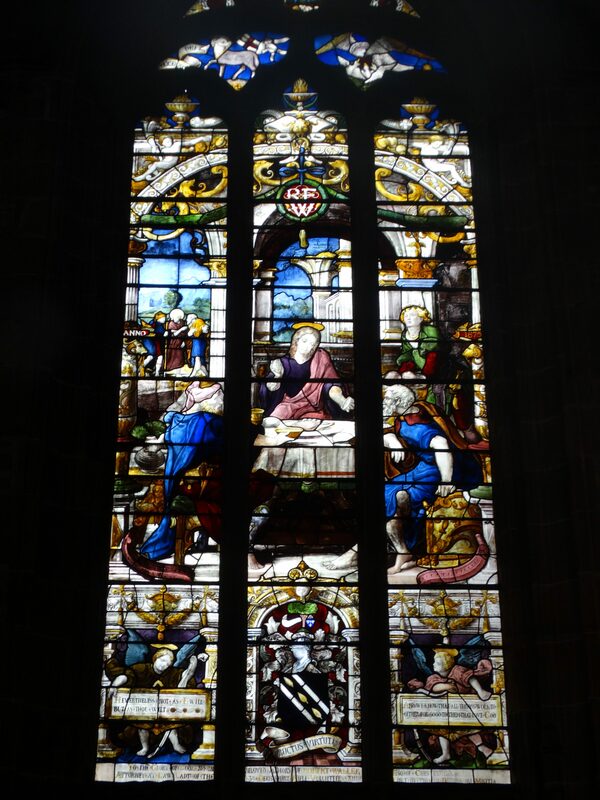 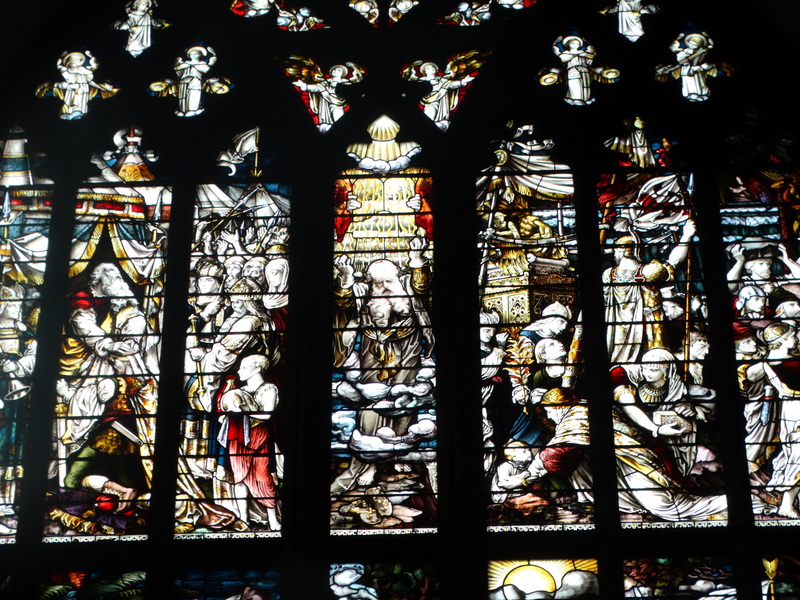 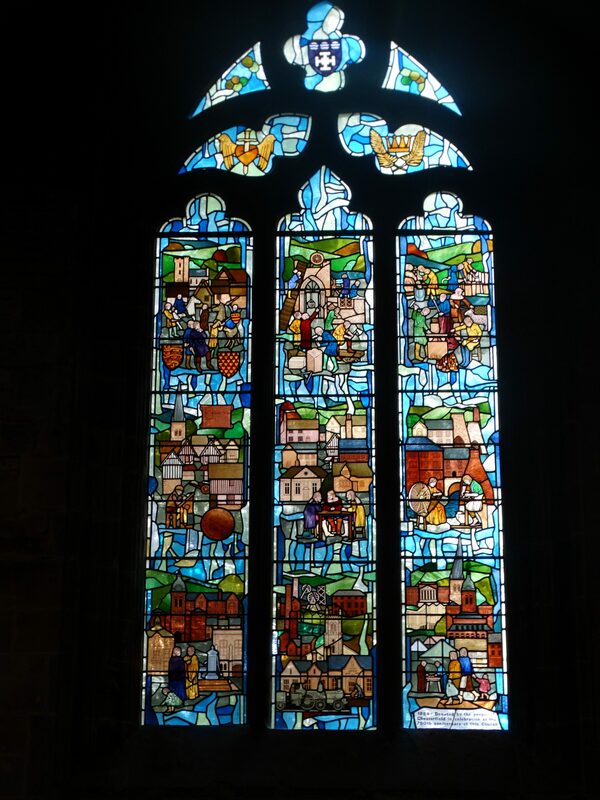 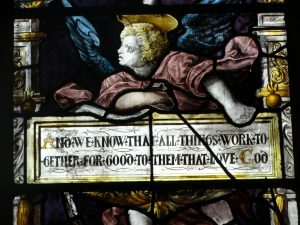 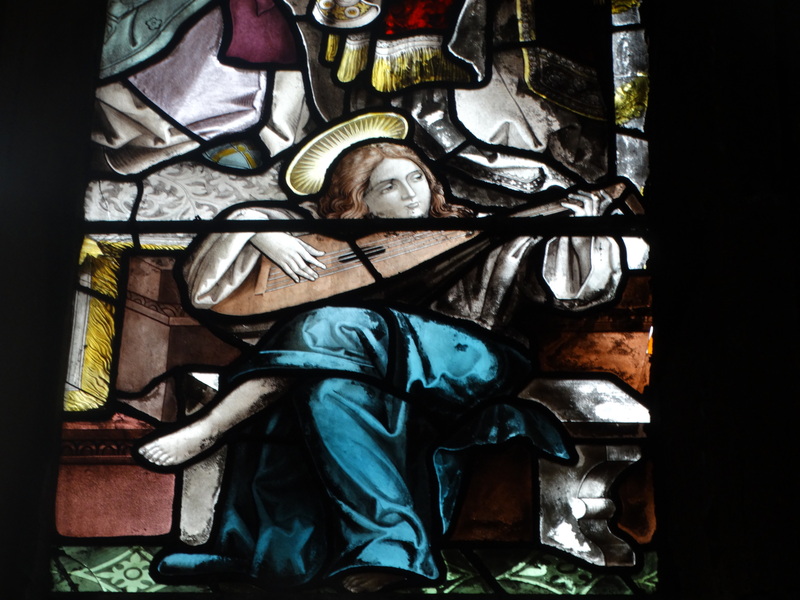 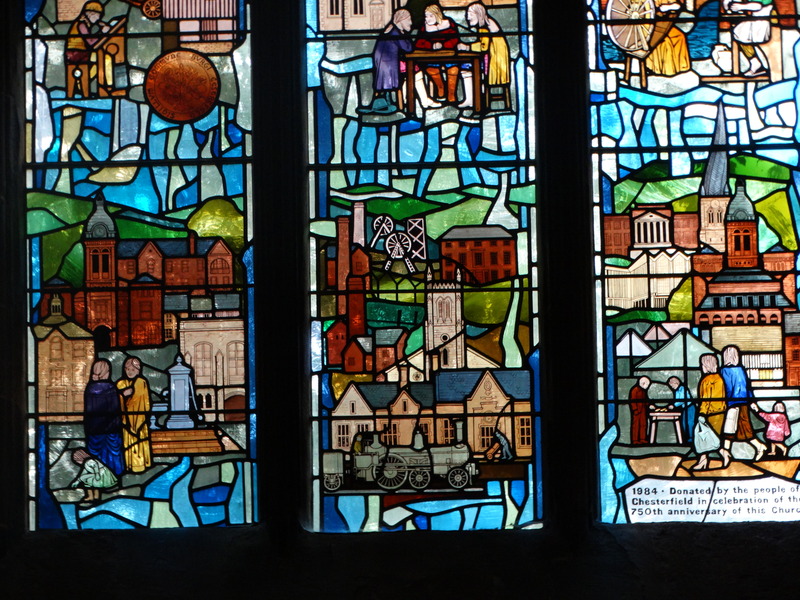 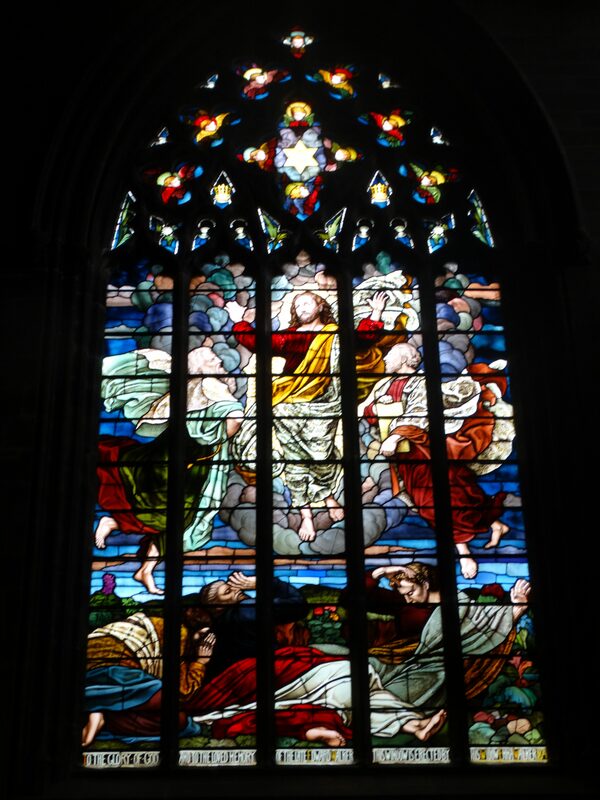 The guide says that this St Francis window is by Sep Waugh, and a search gives me an obituary dated 2013 – website. 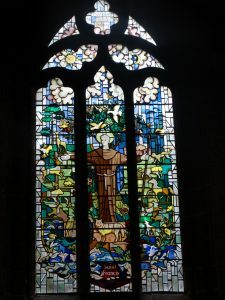 He seems to have produced a lot of Millennium windows. 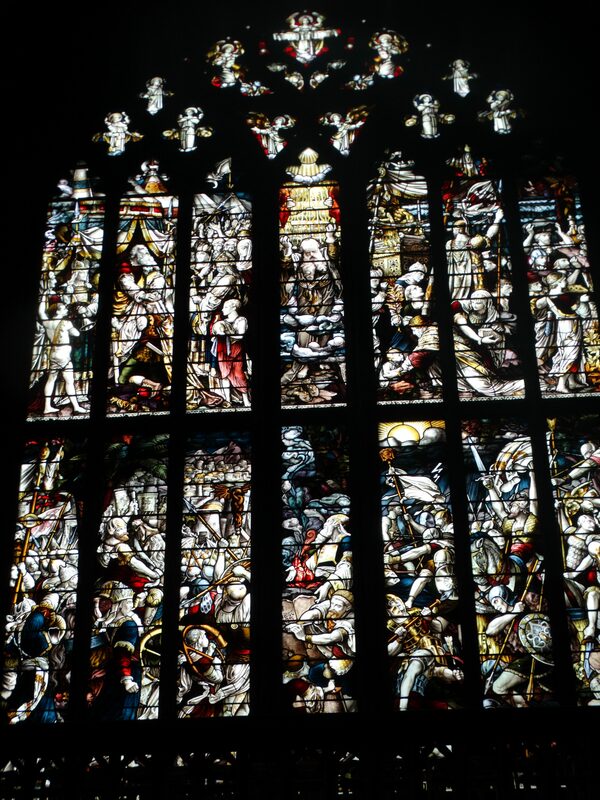 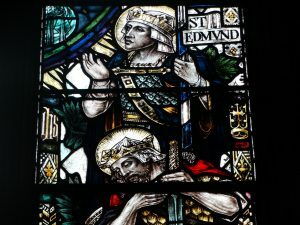 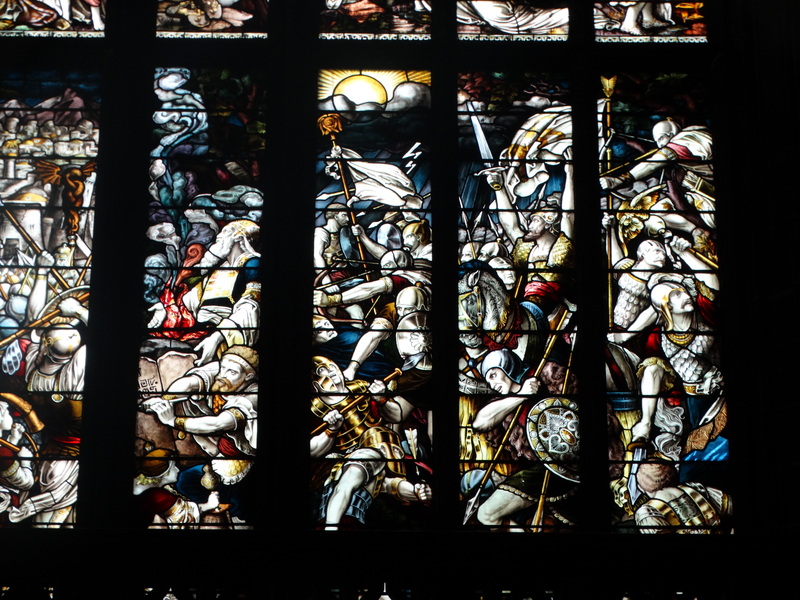 I like much of the other glass, including St Edmund. 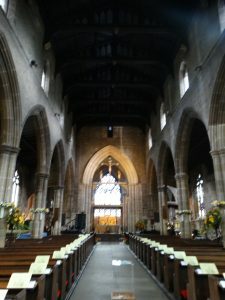 The east end of the church is unusually wide for a parish church, and indicates the prosperity of the town at the time of its construction (the thirteenth century). 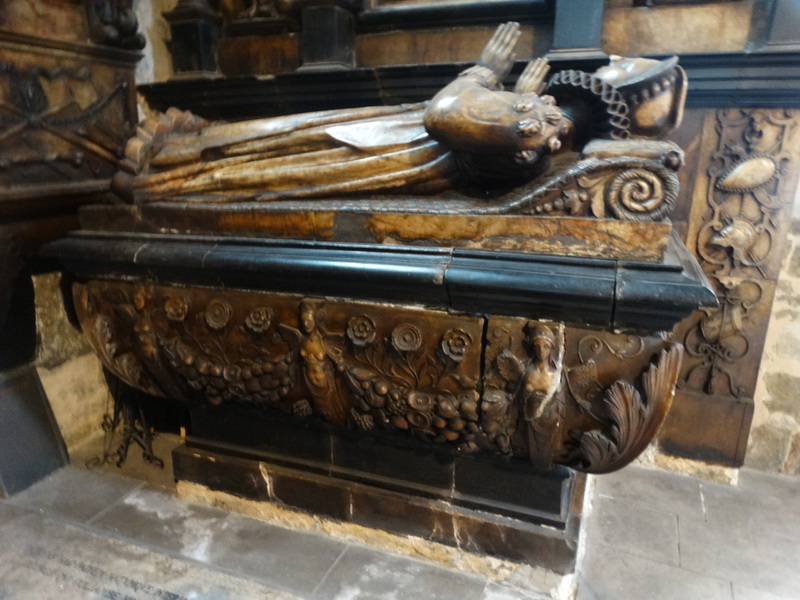 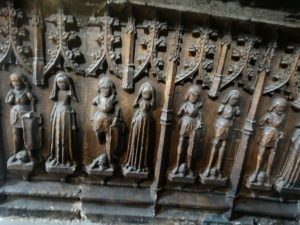 At the south side is the Lady Chapel, and it has some wonderful tombs. I asked permission to cross the rope and get the camera out. They are the tombs of the Foljambe family. 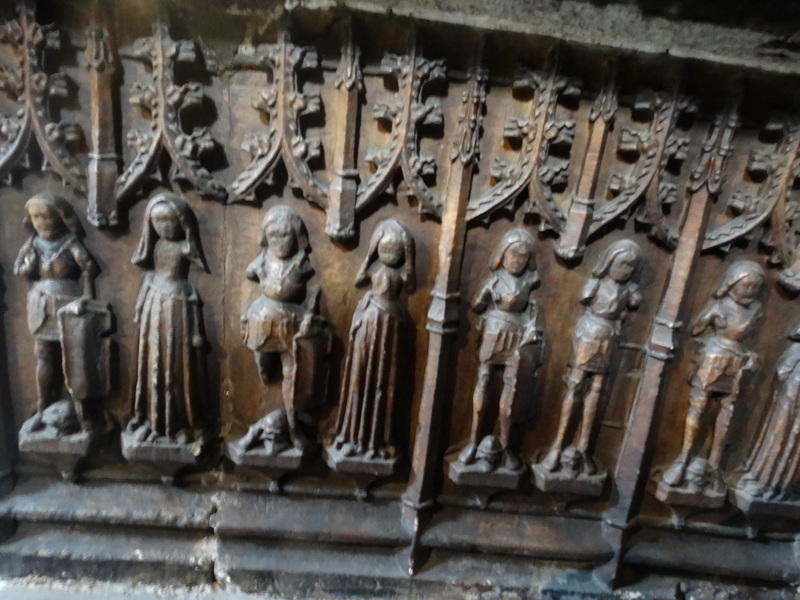 The earliest is the one on the left, Henry Foljambe and his wife Benedicta. It was carved out of alabaster, with a marble top, by Harpur and Moorecock at Burton-on-Trent in 1510 and cost £10. 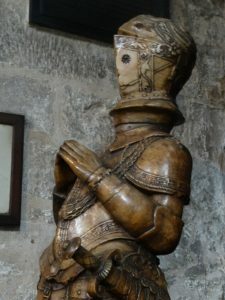 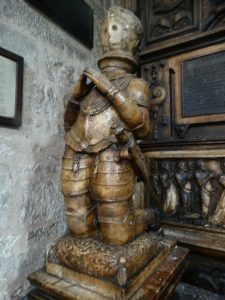 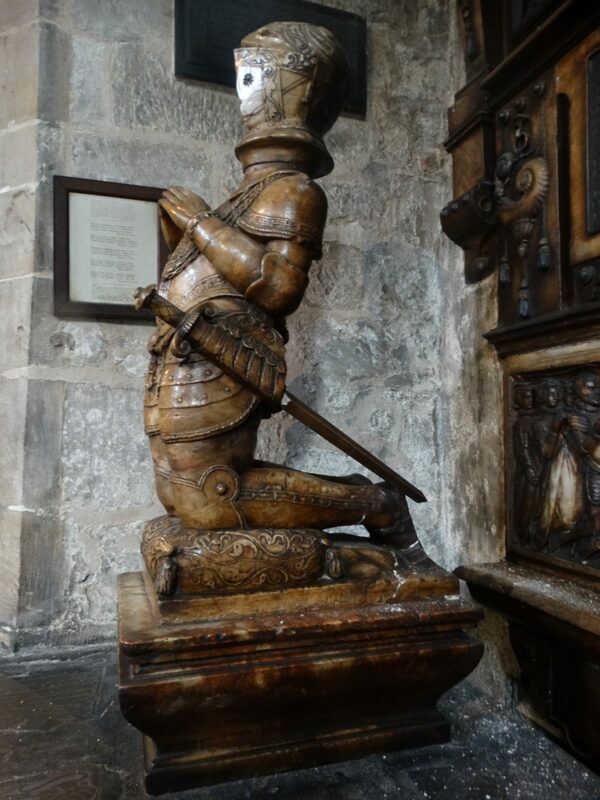 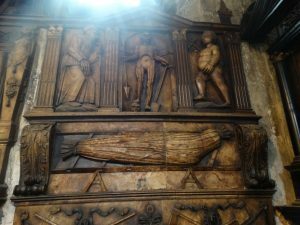 The kneeling figure is thought to be the 13 year old Sir Thomas, who died in 1604. 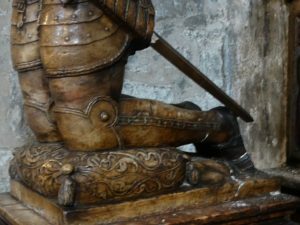 The head doesn’t belong to the body! 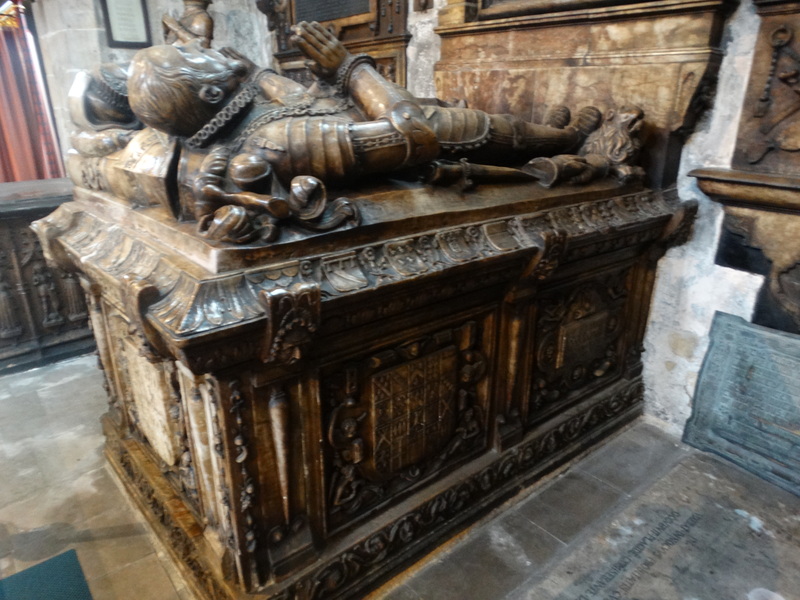 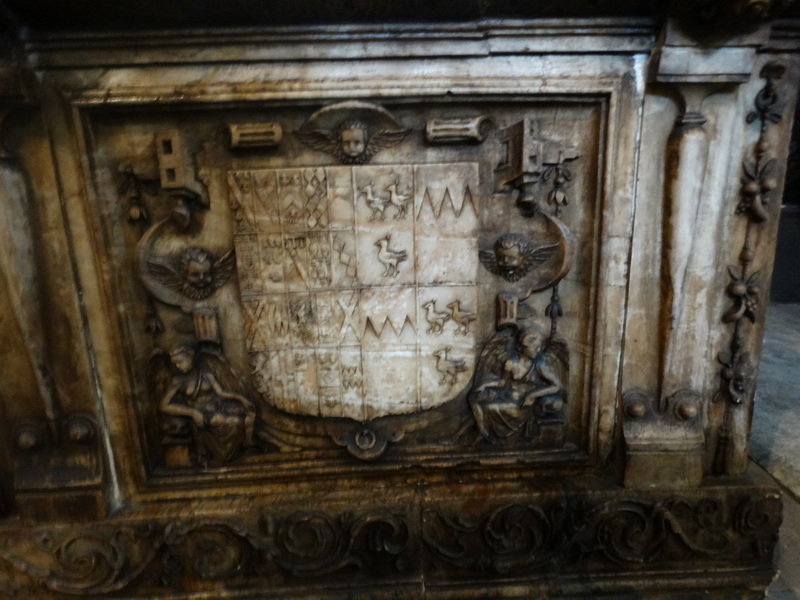 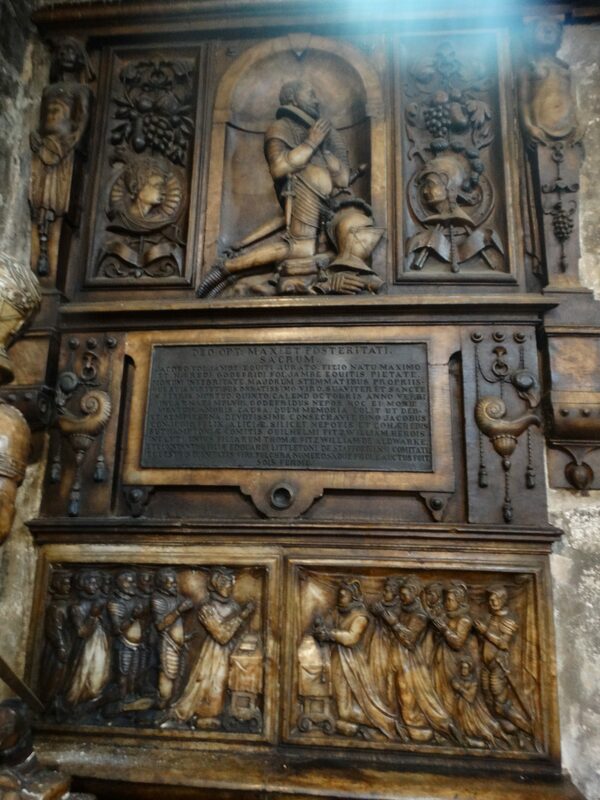 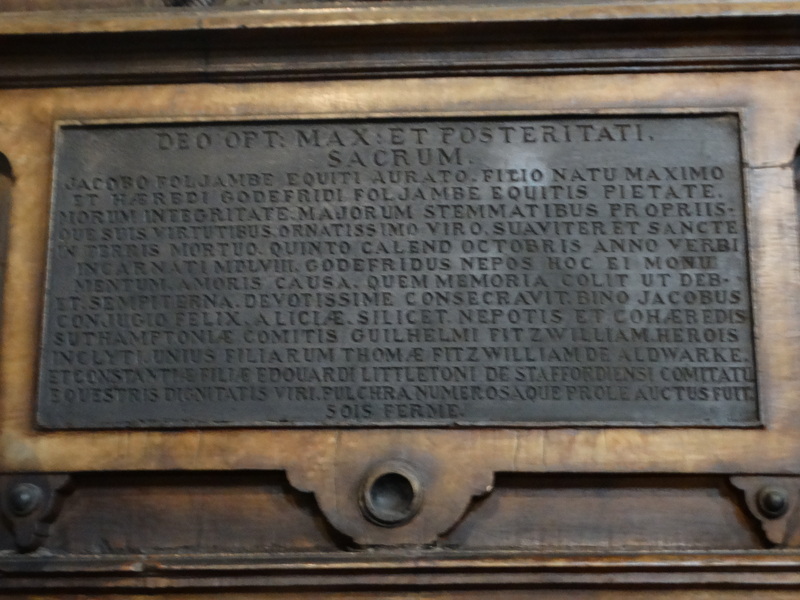 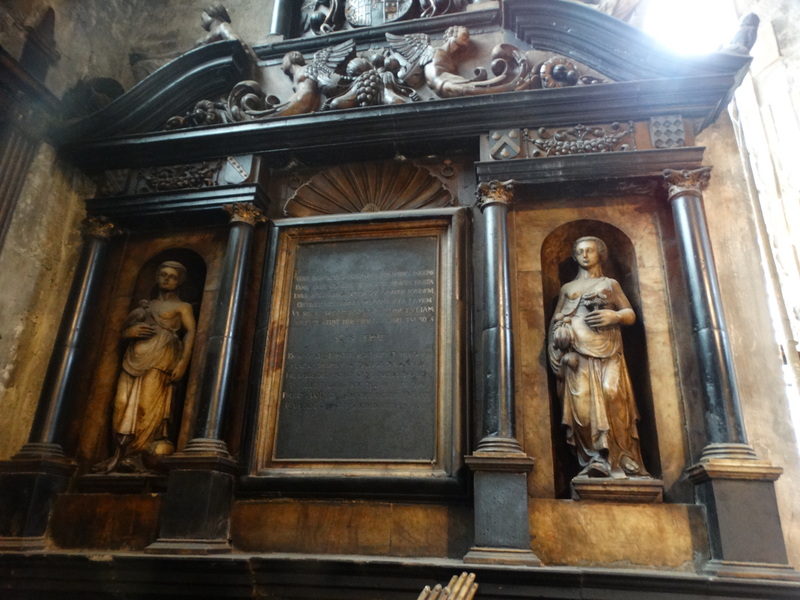 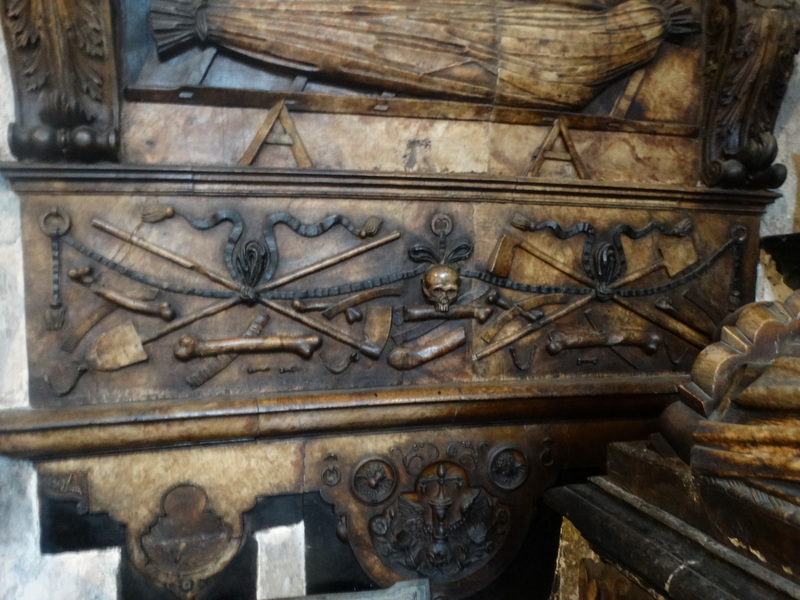 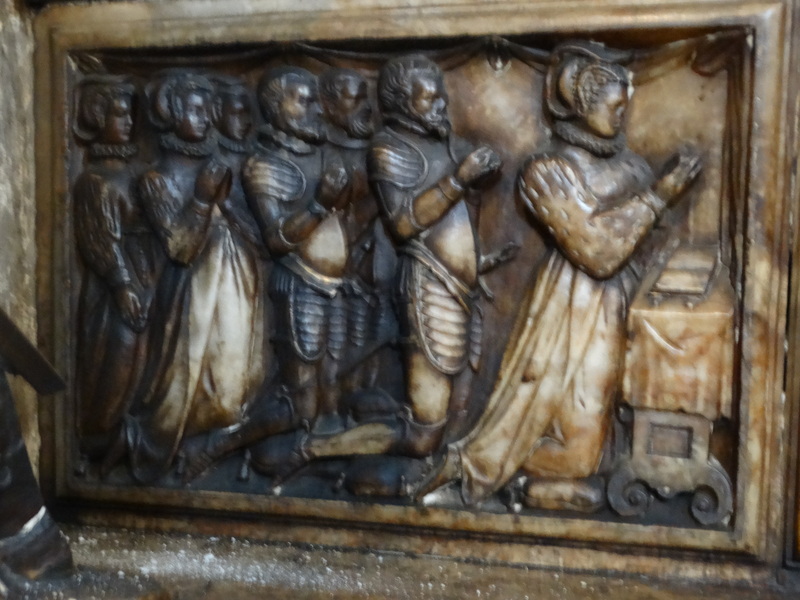 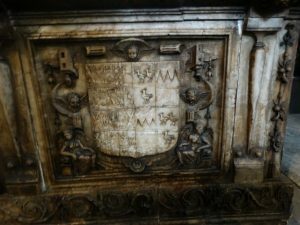 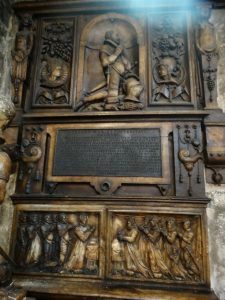 The centre tomb chest (the four photos above) is of Sir Godfrey (died 1585) and his wife Troth. I like the idea of being married to Troth – I pledge thee my troth. 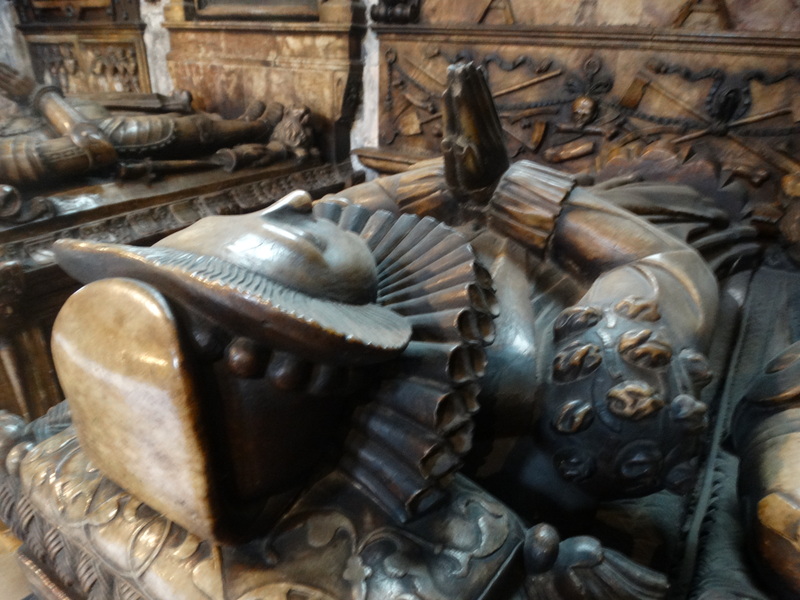 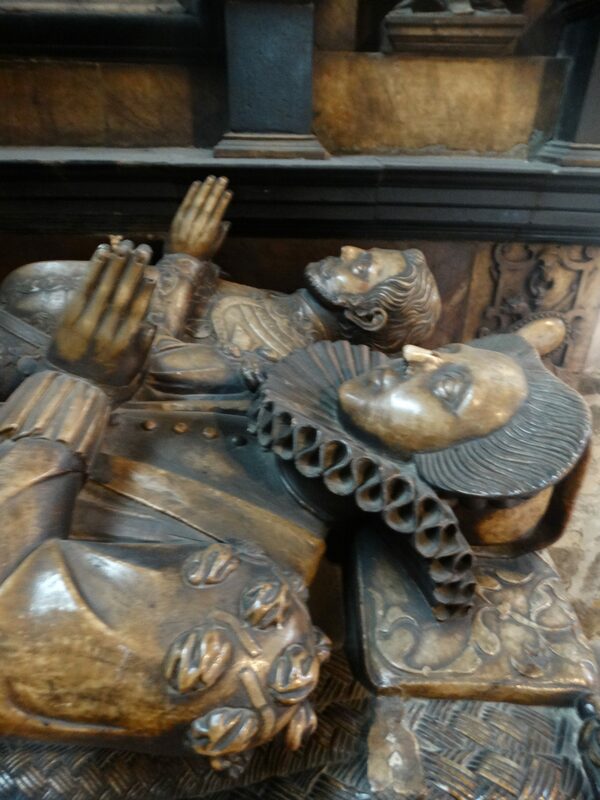 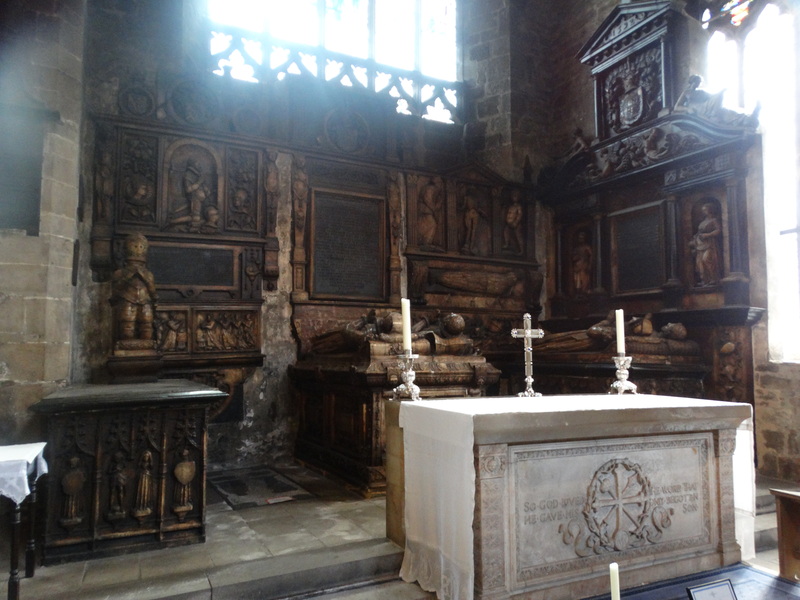 The tomb to the right is Godfrey (died 1594) and his wife (unnamed in the guidebook). 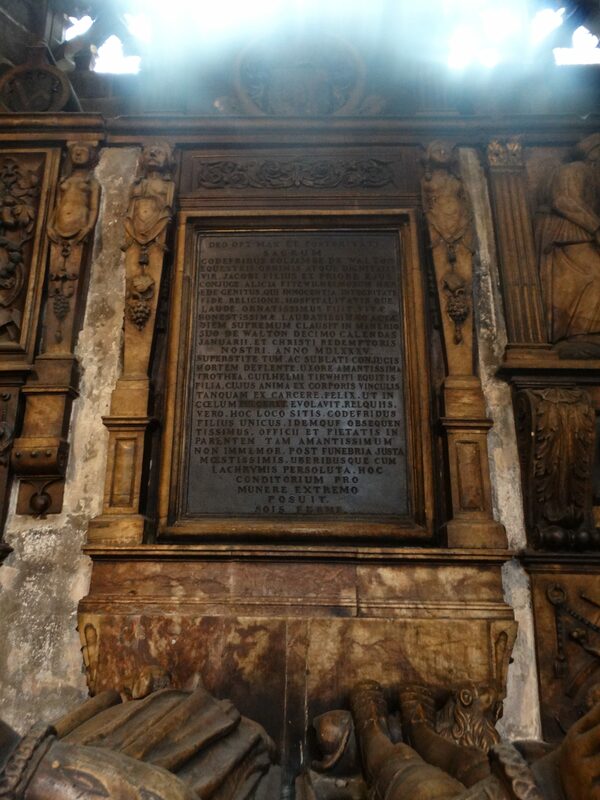 There are other memorials against the wall. 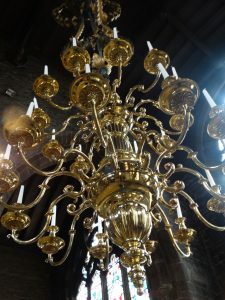 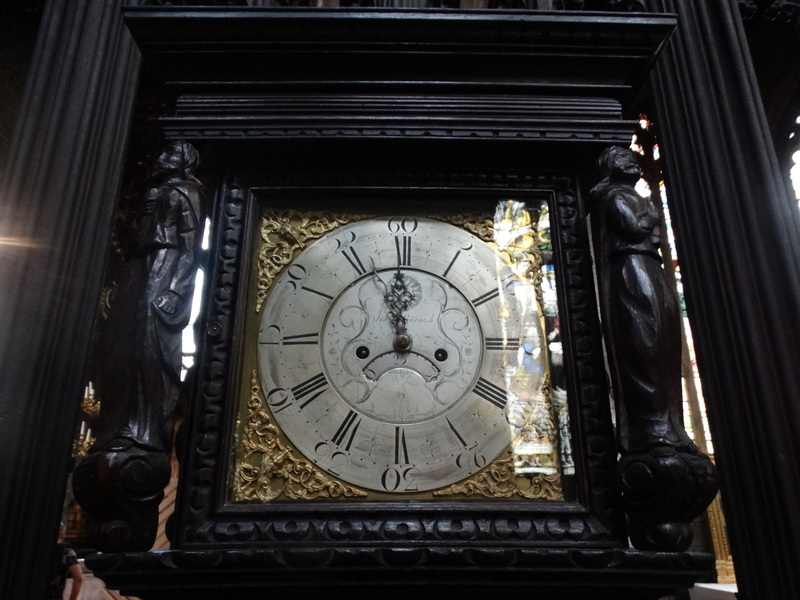 The Parish Chest, a lovely old clock – it would look nice in the Allestree Vicarage – and this chandelier would look good in my hall. 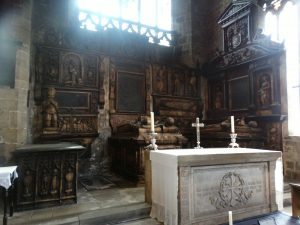 This is a church to re-visit.